SBA Deputy District Director, María de los Ángeles de Jesús. 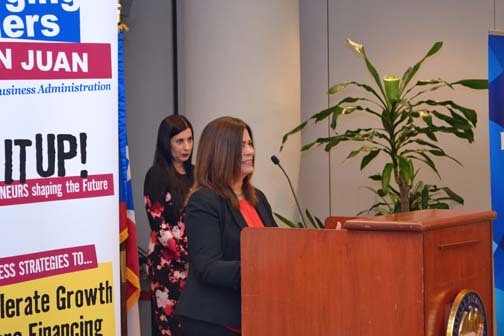 The U. S. Small Business Administration Puerto Rico and U.S. Virgin Islands district office finalized the third cycle of the federal agency’s Emerging Leaders training series in San Juan, graduating the 20 companies selected for the program, SBA Deputy District Director María de los Angeles de Jesús announced. The following companies have graduated from the Emerging Leaders Class of 2017: The following companies have been competitively selected for the Emerging Leaders Class of 2017 in Puerto Rico: A&M Exterminating Services, Inc.; AG Environmental PSC; BIM Contractors LLC; BioPharma Consulting Services Inc.; María Umpierre Marchand PSC; E.R.C. Manufacturing Inc.; EAS Systems, Inc.; Elucidate Technologies, Inc.; EQVAL Consulting Group Inc.; Fundación de Investigación de Diego; Gascó Industrial Corp.; Green Engineering Group PSC; ISLA Language; JR Landscape & Facility Management LLC; PROMMA Private Corp.; Santa & Company Corp.; Space Mart Retail and Real Estate Solutions; Tapia & Fernández Arquitectos CSP; United Forms & Graphics Inc.; and Vega-Fournier, Rivera-Rosas & Associates PSC. The graduates represent all Puerto Rico geographic regions and a variety of industries, from security systems, manufacturing, scientific research, construction and architecture, to dentistry, maintenance, and professional services, among others. Launched in Puerto Rico in April 2015, the SBA’s Emerging Leaders Initiative delivers entrepreneurship education and training focused on small, poised-for-growth companies that are potential job creators. Since its inception in 2008, Emerging Leaders has trained more than 3,000 promising small business owners nationwide. Graduates have reported that nearly 70 percent achieved revenue growth and over 80 percent created new jobs or retained all existing jobs. They also have secured close to $1 billion in contract awards. Hey Buddy!, I found this information for you: "SBA graduates 20 co.’s from Emerging Leaders Training series ’17 in PR". Here is the website link: https://newsismybusiness.com/graduates-emerging-training/. Thank you.